The charming suburban Beacon Inn located in Brookline, MA is only minutes away from Boston attractions. 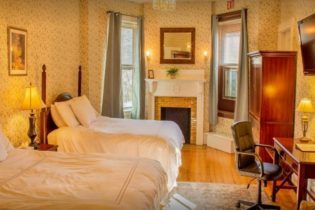 Enjoy elegant accommodations in the 2 restored 19th-century Victorian brownstones across the street from the “T,” Boston’s mass transit system. We also offer 4 fully-furnished apartments. 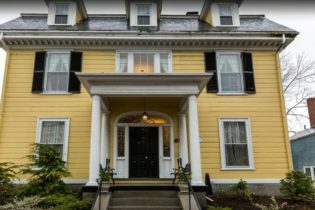 The Beacon Inn is a great place to stay for families of Boston University and Boston College students. Not only is the inn near these schools, but it is also close to quintessential Boston attractions like Fenway Park, Newbury Street, Freedom Trail, Faneuil Hall, and many more. 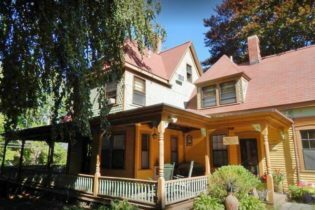 Beechwood Inn Bed and Breakfast in Barnstable, MA is a romantic 1853 Queen Anne Victorian. 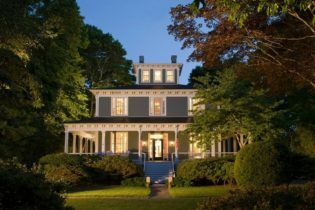 Authentically restored, guests enjoy a reflection of the mood and charm that prevailed in Cape Cod's Victorian past, all in contemporary comfort. 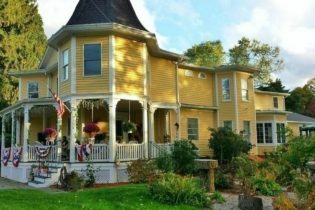 Welcome to the award-winning Beechwood Inn Bed & Breakfast in Barnstable MA… The romantic Victorian inn is located on Cape Cod’s lovely North Shore in the heart of the Historic District. The Inn is within a short walking distance to Barnstable Village’s shops, restaurants, harbor and beach. Beechwood’s central location is convenient to whale watching, bicycling, antique shopping, golf, the attractions of Hyannis and much more. A three course gourmet breakfast is served at individual tables graced with lace tablecloths. Raspberry bread, baked pears and apple harvest pancakes are some of the dishes that may appear on Chef Julie’s daily gourmet menu. Each room is uniquely decorated with antiques. All rooms have king or queen beds; some have fireplaces or great views of Cape Cod Bay. All rooms have air-conditioning, private baths and TV/VCR’s. Beechwood is open year round, we’ll see you soon! The Inn is perfectly located in the geographical center of Cape Cod, making it close to everything our romantic, salt-air peninsula has to offer: biking trails, whale watching, kayaking, golfing, fishing, shopping, theatre, art galleries, and our National Seashore Park. Your Innkeepers are more than happy to help you plan your visit so that you may enjoy “the Cape” to the fullest! 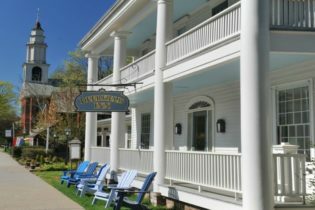 Built in 1884, this classic country inn is an original, full-service inn located in the center of the 350-year old National Historic Landmark village of Deerfield. Just east of the Berkshires, close to Shelburne Falls, Northampton, and Amherst, MA, and Brattleboro, VT. Guests can walk the mile-long main street for free visits to the 12 museum houses and Flynt exhibition center of Historic Deerfield, and PVMA’s Memorial Hall, the oldest museum association in New England. Our welcoming guest rooms are of various types and sizes, in two buildings, and all individually decorated with comfort and relaxation in mind. They are all pleasingly cozy and comfortable with air conditioning, private bathroom, flat screen television, and Wi-Fi. You can pad down the hallways in your inn robe to the Keurig coffeemakers for that morning jumpstart mug of coffee or tea. Breakfast is always a treat, and our Champney’s Restaurant & Tavern with its gorgeous bar is a field-to-fork experience not to be missed. 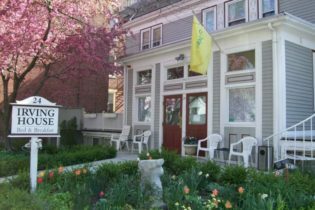 The Harding House in Cambridge, Massachusetts offers guests comfortable accommodations near MIT, Harvard, and downtown Boston. Amenities include hearty continental breakfast, free wireless internet access, and warm hospitality. We are known amongst our many repeat guests for our pleasant, clean accommodations and our kind, caring staff. See you soon! Located in Cambridge, MA, minutes from MIT University, Harvard, and downtown Boston, the Harding House offers a refreshing alternative to chain hotels. Experience unparalleled service in a friendly atmosphere that feels like home. Your stay at our updated 1860’s Victorian includes hearty continental breakfast, wireless internet, free local calls, parking, freshly-baked treats, and wine & cheese. Our 14 spacious and bright guest rooms feature en suite full bath and all the amenities of a modern hotel, plus the charm of a bygone era. We are known amongst our many repeat guests for our pleasant, clean accommodations and our kind, caring staff. Children are welcome. 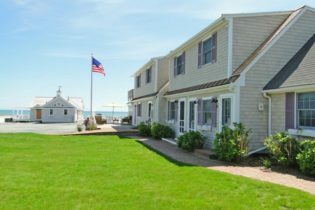 Our quaint beachfront Inn in Harwich Port, MA has been the destination for many families who are looking for a low key Cape Cod beach vacation to escape their hectic day to day schedules. Inn on the Beach is centrally located on Cape Cod and is within an hours drive to Provincetown at the tip of the Cape to the East and Woods Hole/Falmouth to the SouthWest. Vacation, relax and unwind at our waterfront inn with its beautiful, sun drenched, sandy private beach overlooking the warm tranquil waters of Nantucket Sound on Cape Cod in Harwich Port, MA. 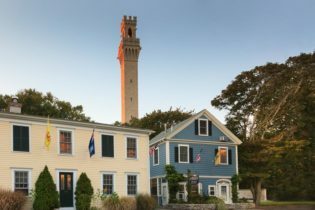 The Inn is centrally located on Cape Cod and is within an hours drive to Provincetown at the tip of the Cape to the East and Woods Hole/Falmouth to the SouthWest. Enjoy our pristine beach and, from your comfortable vantage point along the water’s edge, watch the sailboats racing in the weekly regattas from neighboring harbors. Try our quaint beachfront Inn. It has been the destination for many families over the years who are looking for a low key beach vacation to escape their hectic day to day schedules. Martha's Vineyard luxury with a twist. Modern interior decor. 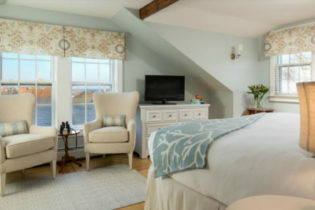 Designed by Simon & Annabelle, winners of Boston Magazine's "Best of Boston"
Completely renovated in 2016 Nobnocket Boutique Inn is the new luxury Bed and Breakfast on Martha’s Vineyard. Designed by award-winning inn designers, this 7 room Boutique Inn has a unique contemporary interior design. It brings a Boutique Hotel experience to a bed and breakfast with expert local concierge service. Chic, modern furnishings are found throughout this upscale New England Inn. It has 7 rooms that all have glass and tile en-suite heated bathrooms. The rooms have individually controlled heating and air conditioning. There is free WiFi throughout the inn. Premium rooms at the inn have fireplaces and soaking tubs. There are many outside areas for sitting, eating breakfast and taking in the beautiful gardens. There are large indoor common areas and the sitting room has a large fireplace. Breakfast is a gourmet full breakfast and can be served in the sun-room, outside on one of the patios or in room. There are complimentary hot and cold drinks. The inn is perfectly located for exploring Martha’s Vineyard. 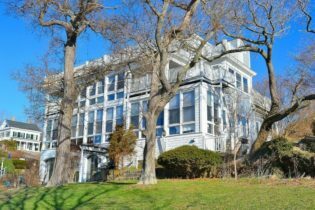 It is within walking distance of the ferry and Vineyard Haven restaurants and shops. It is close to Oak Bluffs and Edgartown. Towels and beach chairs can be provided for your day on one of Martha’s Vineyard’s beautiful sandy beaches. The bed and breakfast provides a quiet retreat for a Martha’s Vineyard getaway or for a Honeymoon. We are close to the marina for sailing, kayaking and water sports and close to Mink Meadows Golf Course. For those looking for a green vacation and wishing to leave the car at home, we provide ferry pick-up, use of bikes and bus passes as part of a special package (see website). We are open year round and English, German and Italian are spoken at the inn. Enjoy this lavish design driven Boutique Inn and all its sumptuous amenities on your next trip to Martha’s Vineyard. 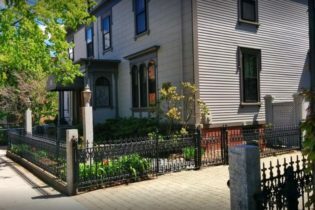 Conveniently located in the center of Cambridge, MA, with the Massachusetts Institute of Technology and Harvard University only a short walk away, Prospect Place Bed & Breakfast is an elegant Victorian home right across from the metropolitan Boston. Choose from 3 elegant guest rooms with king beds, private baths, and full gourmet breakfasts. 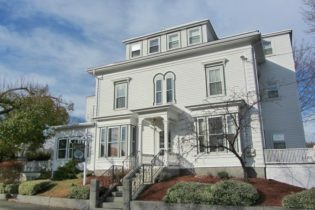 Prospect Place Bed & Breakfast is conveniently located in Central Square of Cambridge, MA. Massachusetts Institute of Technology and Harvard University are our neighbors and only a short walk away and we are over the Charles River from metropolitan Boston. Our comfortable guest rooms offer a good night’s sleep in our king beds, private baths and other elegant decor. The house is eclectically furnished in wonderful antiques and oriental rugs on top of the original wood floors. Premium faux finishes of subtle multi-colored wall glazes add a unique flavor to the decor, while other rooms have authentic reproductions of period wallpapers. Two grand pianos, sculptures and paintings grace the spacious Victorian parlor room. A variety of sumptuous pastries, breads, fresh fruit bowls, juices, coffee, tea or cocoa, as well as eggs in a variety of styles, are served on china, linen and silver each morning. Enjoy the Cape, the islands, and all of this part of New England right from the Simmons Homestead Inn located in Hyannis, MA. Shop, drive around, borrow a bike, beach it, take a walk through great conservation lands or the National Seashore. Our main Inn building is home for rooms 1 through 8, the main common room, the breakfast room, and porches. 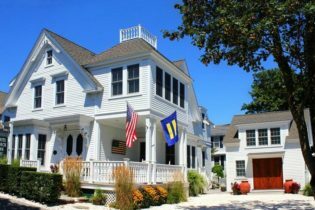 Welcome to The Simmons Homestead, the only Bed & Breakfast Inn nestled in Hyannis Port and truly reflects the spirit of old Cape Cod. 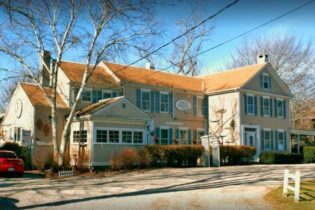 The entire house has been designed to be a Cape Cod bed and breakfast providing a warm, friendly, relaxing, and romantic atmosphere. It is a place to meet new friends, to feel at home, and relax. 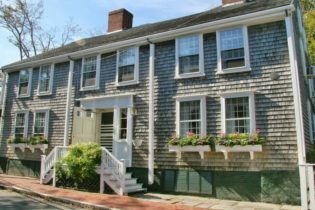 A pleasant haven to retire to after a day of exploring, it is situated where you can wander around Cape Cod, enjoy the beach, or take a day trip to Nantucket or Martha’s Vineyard. At the end of the day, you will return to the Inn, sit on the porch with wine, and relax. Then go to some of the best restaurants on all of Cape Cod, which are less than a mile away. We take dogs of all shapes and sizes and same with kids, have handouts on what to do and see, WiFi Internet connections, discount coupons for restaurants, ferries to the Islands and much more. All the rooms are unique and beautifully furnished, some with canopy beds, brass beds and all with plants, animals, love and fun. All of the rooms have wonderful animal themes. There are 14 guest rooms in total, including a two bedroom suite set up just for families, and the Cat Room which is a two room suite with a sitting area and a separate king size bedroom. The rooms have either king or queen size beds. Welcome to Stonover Farm; a fully appointed luxury Bed & Breakfast located on 10 acres in Lenox just a short walk from Tanglewood, MA. Walking or running on Under Mountain Road is a local pastime, and there are many nearby biking and hiking trails, and Pleasant Valley. 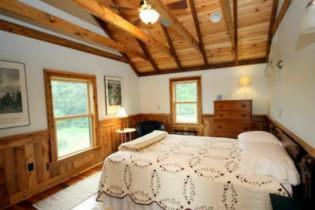 Welcome to Stonover Farm Bed & Breakfast located in historic Lenox, Massachusetts, where you can walk to Tanglewood in 15 minutes or take a nature walk on a raised boardwalk, through the woods to a huge marsh. Stonover Farm is a 120-year-old Berkshire “cottage” which has been renovated extensively to provide luxury quarters. The main house, Rock Cottage and the School House provide a unique Bed & Breakfast experience. Rock Cottage is on a hill with a splendid view of the duck pond and the meadow beyond. Surrounded by windows on the front and side, the cottage is centrally air-conditioned and fully equipped for stays of 3 days or 3 weeks. The 3 Main House suites have sitting room, bedroom, bath, 14″ mattresses, robes, amenities, wi-fi, Iphone Docking station / streamer, hi-def big screen TV’s with full cable, DVD player with 300 movies and remote control air conditioning. There’s a free guest landline phone on the main floor. Rock Cottage has a fully equipped kitchen, living room, 2 bedrooms, furnished porch and wood-burning fireplace. The cottage offers comfort and privacy, and is particularly well suited to families with children. 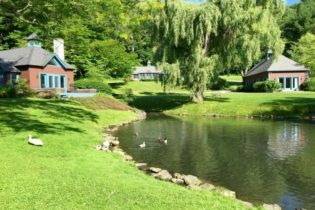 The School House suite stands alone by the duck pond, has 12-foot ceilings, an oversized bathroom with large tub, separate shower and 2 sinks, heated floors, gas fireplace and furnished patio. We also host 10 Spring and Fall full wedding weekends, featuring our stunning barn which accommodates up to 200 guests for dinner and dancing. 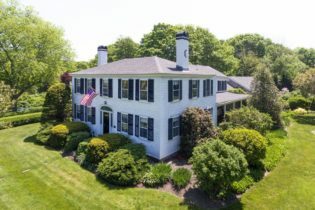 The Captain's Manor bed and breakfast is an elegant and comfortable home base to enjoy the entertainment, gorgeous scenery, cultural opportunities, intimate dining or numerous sporting activities of Cape Cod. A short stroll to Falmouth Village and the Shining Sea bikeway. 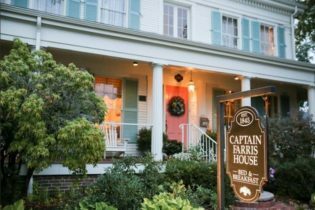 The Captain’s Manor bed and breakfast is an elegant and comfortable home base to enjoy the entertainment, gorgeous scenery, cultural opportunities, intimate dining or numerous sporting activities of Cape Cod. A short stroll to Falmouth Village and the Shining Sea bike-way. 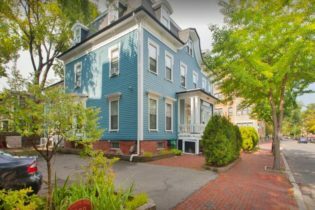 A splendid retreat in the heart of Falmouth Village’s historic district. Discover the graceful accommodations of this stately home listed on the National Historic Register of Historic Places. You might choose to relax on the veranda and enjoy the lovely acre plus of park-like grounds or take a short stroll to downtown Falmouth Village and discover many boutique shops, restaurants, galleries, and museums. Enjoy a romantic beachfront getaway at this Cape Ann Bed & Breakfast in Rockport, MA. 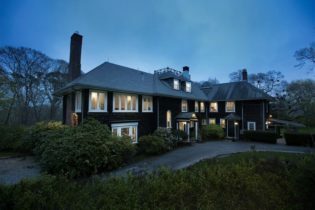 This New England coastal hideaway is a great place for a relaxing family vacation and offers spacious accommodations for a small business retreat. The seven guestrooms offer king or queen size beds with private entrances and spectacular ocean views. Take in the spectacular views of the Atlantic Ocean at The Quarterdeck Inn By The Sea in Rockport, Massachusetts. This oceanfront Colonial-style inn offers seven spacious rooms with plush bedding and modern furnishings. Enjoy the view from the rocky coastline or views of the blossoming gardens from large windows. The guestrooms feature private decks or entrances and private baths with jetted tubs. 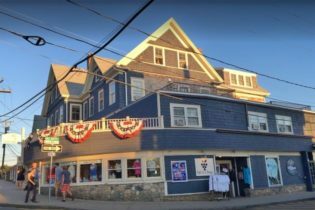 Centrally located to Cape Ann attractions, The Quarterdeck Inn By The Sea is the perfect getaway for family fun and business retreats year-round. The Rockport, Cape Ann and Gloucester region offers various recreation including hiking & biking, fishing, golfing, and whale watching. 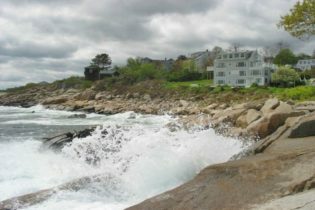 Just 45 minutes from Boston, guests will enjoy the beautiful beaches and scenic walking trails of the Cape Ann region. Guests will enjoy the history of Rockport with a visit to Motif #1 on Bearskin Neck and other historic attractions of this 250 year-old town. Named #1 Small Hotel in the U.S.! 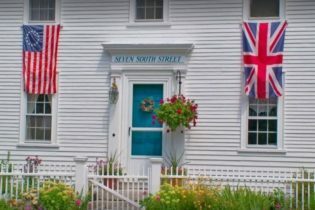 Union Street Inn is a luxury boutique hotel in the heart of Nantucket, MA. We are just a short stroll from popular shops, restaurants, galleries, and museums. Each of our guest rooms features designer furniture and fabrics, private baths, air conditioning, cable TV, and complimentary WiFi. Several rooms include elegant wood-burning fireplaces. From active pursuits such as fishing, biking, and sailing, to more laid-back adventures, such as wine tasting and strolling through a world-class whaling museum, come experience all that Nantucket has to offer.